Mordechai Anielewicz (1919 – May 8, 1943) was the commander of the ŻOB or the Żydowska Organizacja Bojowa (English: Jewish Fighting Organization). Anielewicz helped to organize and lead the Warsaw Ghetto Uprising. The uprising is the most famous example of Jewish resistance during World War II. At age 23, Anielewicz helped arm the Jews and encouraged them to resist getting into the railroad cars that would take them to the concentration camps. In January 1943, the German troops tried to enter the ghetto to round up another group of people for deportation. During this time the Warsaw ghetto fighters fired upon German troops and after a few days the troops retreated. This small victory encouraged the resistance members to continue fighting until the end. Mordecai Anielewicz was born into a Jewish working-class family in a poor neighborhood of Wyszkow (near Warsaw), Poland. He grew up extremely poor. Even at a young age, Anielewicz he was known for standing up to bullying Poles. As he matured he became a leader and organizer of his peers. Anielewicz spent a short time as a member of the Betar, a Revisionist Zionist youth movement founded in 1923. After graduating from high school, he joined and became a leader in the Zionist-socialist youth movement "Hashomer Hatzair". Nazi troops invaded Poland in 1939. On September 7, 1939, one week after the invasion, Anielewicz escaped with members of his group. They left Warsaw and headed toward Eastern Poland, in the hopes that Polish troops would restrain the German advance. His plans were altered when the Red Army occupied all of Poland in just three weeks time. Once the Germans were in control Anielewicz then tried to cross from Soviet occupied Poland into Romania to open a route for young Jews to escape into Romania and thence to Mandatory Palestine. In the process Anielewicz was caught and thrown into a prison located in the Soviet Union. Upon his release a short while later, he made his way to Vilna, Lithuania, which was under Soviet control. This was a place where hundreds of Jewish refugees, other youth movement members and political groups had gathered. Anielewicz convinced some to return to Poland and fight the Germans. Anielewicz, along with his girlfriend, Mira Fuchrer returned to Poland in January of 1940. There he began to organize cells and groups of young people. He participated in underground publications, organized meetings and seminars and visited other groups in different cities. When Mordechai and Mira volunteered to return to Warsaw they became leaders in the resistance movement. He began educating himself in the Hebrew language, studying history and economics and making his views known in underground publications. In the summer of 1942, Anielewicz traveled to southwestern Poland, annexed to Germany, attempting to organize armed resistance. When he returned to Warsaw, he found that a major deportation to the Treblinka extermination camp had taken most of the ghetto's 350,000 Jews, leaving only 60,000. As a result he joined The Żydowska Organizacja Bojowa. (ŻOB, Polish for the "Jewish Fighting Organization") In November, Anielewitz he was appointed chief commander of this organization. The youth groups that were instrumental in forming the ŻOB had anticipated German intentions to annihilate Warsaw Jewry and began to shift from an educational and cultural focus to self-defense and eventual armed struggle. Unlike the older generation, the youth groups took these reports seriously and had no illusions about the true intentions of the Nazis. A document published three months before the start of the deportations by Hashomer Hatzair declared: We know that Hitler's system of murder, slaughter and robbery leads steadily to a dead end and the destruction of the Jews. The most critical event in strengthening the ŻOB came when the Bundists, the Communists and a number of adult Zionist political parties banded together under the ŻOB banner and Anielewicz's leadership. In early 1943, he was successful in forming a valuable connection with the Polish government in exile in London. It was through this alliance that the Warsaw ghetto was able to obtain weapons and ammunition to fuel their resistance. Mordechai Anielewicz and his girlfriend Mira Fuchrer in the ruined Warsaw ghetto. Painted by Shimon Garmize. 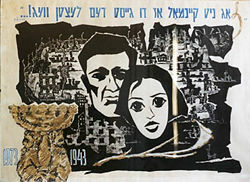 Above the mural is the first line of the Partisan's Song "Zog Nit Keinmol" in Yiddish. The Warsaw Ghetto was a part of the city that had been walled off from the rest of Warsaw. It was compulsory that for all Jews to transfer their residence to the ghetto. The ghetto, which usually only had one gate, was locked at night. Many of the Jews who were forced into the ghettos, were unaware of Hitler's Final Solution, believing that living together in ghettos would garner mutual respect and a sense of community to cling to until the Nazis were defeated. The Warsaw Ghetto was established in October 1940, and initially held 200,000 people. But over the next three years, the ghetto would become severely crowded and the population would grow. The wall surrounding the ghetto was very high and the sanitary conditions of the ghetto were non-existent. There were few ways to obtain food, and often, many died daily of starvation. Nevertheless, the Jews organized an educational system and became resourceful in finding ways to sell things for food. It was under these circumstances that Mordechai Anielewicz organized the resistance. Many acts of rebellion had been delayed because several of the Jews refused to believe the stories of mass murder filtering into the ghetto. The first rebellion occurred on January 18, 1943, when Anielewicz and his army prevented the second major deportation of the remaining ghetto Jews. The event that is now know as the Warsaw Ghetto Uprising happened on April 19, on the eve of Passover. The German Nazis came to the ghetto to perform the final deportation and the uprising broke out. The Nazis were taken by such surprise that they suffered many casualties at the beginning of the uprising. The Jews were able to hold the German army off for three days. These three days were full of bloody street battles. The Nazis greatly outnumbered the resistance in both men and weapons. The resistance numbered only 750 Jewish fighters, but they held off the heavily armed and well-trained Germans for almost a month. Their arsenal consisted of nine rifles, 59 pistols and several hundred grenades, explosives and mines. In the end, the Jews did not have a chance, but they would not surrender. Even the women and children would not give up; they remained hiding in shelters and the Nazis had to go house by house through the ghetto, burying and killing. After four weeks the ghetto was defeated. The uprising ended on May 16, 1943. The person in charge, General Jurgen Stroop, could now report that "there is no more Jewish suburb in Warsaw." Under Anielewicz's leadership, Warsaw Ghetto Jews staged the first urban uprising in occupied Europe. The uprising ended with the murder of 7,000, and the capture of 56,000 Jews who were all deported to concentration camps. On the forty-second day of fighting, only one house remained standing. The few surviving Jews contested every floor until none was left to fight.When the Germans left Warsaw in January 1945 there were only 20 Jews left in the city. 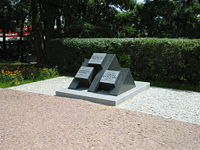 Mordechai Anielewicz's memorial in Wyszków. Anielewicz' last act of resistance was to commit suicide, along with his girlfriend and many of his staff, in the ŻOB bunker at 18 Miła Street on May 8, 1943, once they knew that their capture was inevitable. His body was never found, and it is generally believed that his remains were taken to the nearby crematoriums along with the bodies of several other Jewish people. It is impossible to put into words what we have been through. One thing is clear, what happened exceeded our boldest dreams. The Germans ran twice from the ghetto. One of our companies held out for 40 minutes and another – for more than 6 hours. The mine set in the "brushmakers" area exploded. Several of our companies attacked the dispersing Germans. Our losses in manpower are minimal. That is also an achievement. Y. [Yechiel] fell. He fell a hero, at the machine-gun. I feel that great things are happening and what we dared do is of great, enormous importance…. Beginning from today we shall shift over to the partisan tactic. Three battle companies will move out tonight, with two tasks: reconnaissance and obtaining arms. Do you remember, short-range weapons are of no use to us. We use such weapons only rarely. What we need urgently: grenades, rifles, machine-guns and explosives. It is impossible to describe the conditions under which the Jews of the ghetto are now living. Only a few will be able to hold out. The remainder will die sooner or later. Their fate is decided. In almost all the hiding places in which thousands are concealing themselves it is not possible to light a candle for lack of air. With the aid of our transmitter we heard the marvelous report on our fighting by the "Shavit" radio station. The fact that we are remembered beyond the ghetto encourages us in our struggle. Peace go with you, my friend! Perhaps we may still meet again! The dream of my life has risen to become fact. Self-defense in the ghetto will have been a reality. Jewish armed resistance and revenge are facts. I have been a witness to the magnificent, heroic fighting of Jewish men in battle. In 1944, Anielewicz was posthumously awarded the Virtuti Militari, the Polish military cross, by the Polish government in exile. The Kibbutz Yad Mordechai in Israel is named after him and a monument was erected there in his memory. In the late 1980s the Moreshet Mordecai Anielewicz Memorial - A Youth Movement Campus was conceived at the educational institute, Givat Haviva, under the direction of the late Haikah Grossman. The center focuses on the unique phenomenon of Jewish and Zionist Youth Movements and their special role in the history of the Jewish people in modern times and in the rebirth of Israel. At the Moreshet Center for Holocaust Studies in Israel special emphasis is directed to educating youth (Arabs and Jews, students and teachers, as well as overseas visitors) to take personal and social responsibility for their own generation and for the national and social environment in which they live. The Moreshet Archives, also established in memory of Mordecai Anielewicz, has gained international renown. Thousands of testimonies and primary source materials are preserved there. A depository of unique materials, obtained in recent years from Eastern European archives, includes rare Secret Service and Gestapo documents. Givat Haviva was founded in 1949 as an extended educational center of the Kibbutz Artzi movement. It is the largest and oldest Jewish-Arab institution for co-existence education and dialogue in Israel. ↑ Mass, Rochelle. 2003.Mordechai Anielewicz wzo.org Retrieved June 24, 2007. ↑ Żydowska Organizacja Bojowa Answers.com. Retrieved June 24, 2007. ↑ Mass, Rochelle. 2003. 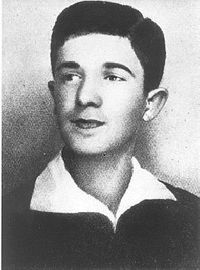 Mordechai Anielewicz wzo.org. Retrieved June 24, 2007. ↑ 62nd Anniversary of Warsaw Ghetto Uprising Official website of the City of Warsaw. Retrieved June 24, 2007. ↑ Zionism and Israel -Biographies Zionism-Israel.com. Retrieved June 24, 2007. Mordecai Anielewicz Jewish Virtual Library. Mordechai Anielewicz, Hero of the Warsaw Ghetto Uprising Zionism-Israel.com. This page was last modified on 20 October 2018, at 16:46.